Everyone has at least one thing they have to do before they die. Some even have a list. But how many goals and dreams on this list are actually achieved? At the ripe-old age of 26, Sebastian realised that like most people, he has not achieved anything on his long-forgotten list. The death of a close friend combined with a naturally abstract view on life sparks a moment of clarity. 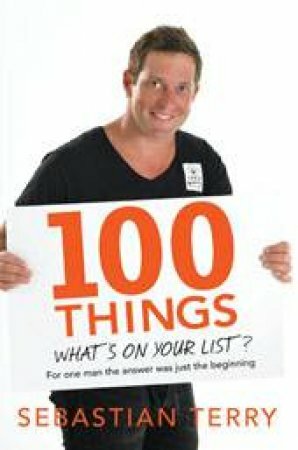 In the midst of overseas trip, Sebastian decides to put pen to paper and re-create a list of 100 Things. His goal, to tick off everything. Its the start of a crazy, no holds barred adventure that sees Sebastian travel to the ends of the earth on a quest to prove that anything is possible, including true fulfillment. Along the way, Sebastian strives to raise $100,000 for Camp Quality, a great organisation creating happiness for children and families affected by Cancer Support for the journey has been unexpected and also world-wide "What started as a journey based on my own goals and imagination has turned into something so much bigger. Never in a million years did I think anyone would take inspiration from this trip, but I now receive emails from people everywhere offering support, asking for advice and even thanking me! It's very humbling" - Seb Terry 100 Things is a humorous, action packed adventure dedicated to anyone who's ever worried about their age, or dreamt about living every day like it was their last.